Yoga instructors: how great would it be to shine in a spotlight and teach in 360 degrees? Introducing the lily pad of yoga mats, Yoga Accessories’ roomy 6-Foot Round Yoga Mat is one of a kind! 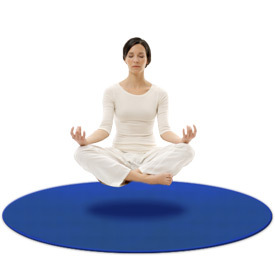 We also highly recommend this mat for meditation, tai chi, and larger-bodied yogis. This mat will keep you hygienically-sound vs. a standard yoga mat: feel free to reach and stretch out in public areas without touching the ground. The Round Yoga Mat is also perfect in your living room: you can actually complete an entire yoga DVD without having to readjust your yoga mat, as poses transition from side to side and forward to back. Yoga Accessories’ Round Mat is thicker, cheaper and larger (at a full six feet in diameter) than competitor’s round mats. The round shape is also a much safer option in Mommy and Me classes, allowing you to place your little one safely next to your body as you move around and stretch. Our students use these mats to meet for their small groups at church. They are the perfect size, store easily, and the quality is excellent! I am a repeat customer and will continue to be. I absolutely love this mat,I got the purple one,6 ft.It works great !! I put off getting one for years,I didn't know if it would be thick enough to work over carpet.It is and works great and keeps me from slipping. I got my purple round yoga mat and love it! I’ve been using it daily and sometimes several times a day. I like that no matter which direction I go I don’t have to step off the mat for my asanas. Even when I’m watching an instructor, there is no problem from front to back or left to right like with a rectangle mat. It’s even thicker and more durable than I expected! I love this mat, it is a great thickness and is large for somatic yoga exercises that include taking more space. I am very happy I ordered it. Highly recommended! I purchased this as a teachers' mat for my yoga studio. It's great quality, thick and extra sticky, and very durable. All my teachers love it, not to mention the round shape gives it a great energy. I used it to replace a large black mat purchased on another site that was poor quality, shredding up very easily, and oh yeah, twice the price. I highly recommend this mat. I have used this mat for over 10 years. "lost" it and just replaced it. Wonderful for teaching! I'm surprised round mats aren't more popular because they give you so much freedom in your practice to move any direction without thinking of the front or back. I love that this may is extra thick (I don't need a blanket under my knees any more) and that it is 6' in diameter instead of 5', which isn't quite big enough for floor practice. Price including shipping to Canada was cheaper than any other option online. I use this on a hardwood floor at home for Tai Chi practice. It is large enough to accommodate all forms. It is well made, with just the right combination of grip and cushion. I use this at home and it's great! Perfect size for yoga class on hard gym floor. No more turning around to stay on the mat. Thicker than standard mat which helps. To take to class I fold in 1/2 than 1/2 again to carry - just like it was in shipping box. Not as easy as rolled up small mat but so worth it during class. Only sorry I waited so long to order. Ordered dark blue. Go for it, you won't be sorry.